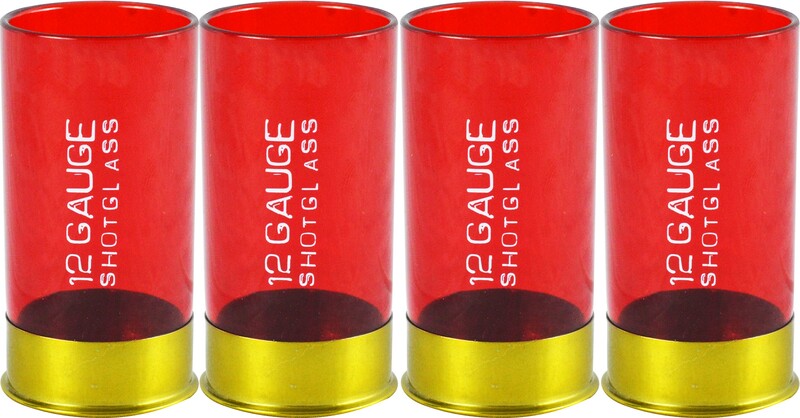 Blow everyone away at your next party with these realistic 12 Gauge Shotgun Shell Shot Glasses from Fairly Odd Novelties! If you're tired of boring and uninspired shot glasses, then these will deliver a blast of excitement and laughs at any event where drinks are served! Lock and load (and drink)! Blow everyone away at your next party with these realistic 12 Gauge Shotgun Shell Shot Glasses from Fairly Odd Novelties! If you're tired of boring and uninspired shot glasses, then these will deliver a blast of excitement and laughs at any event where drinks are served! These glasses have authentic shotgun style, with red plastic tops and a golden metallic base, but you can leave the boomstick at home! Whether you're a hunter or just a gun enthusiast, you'll love the way these shot glasses remind you of your passion. This set of 4 shot glasses also makes an excellent gift, and is sure to be a booming success at any birthday, white elephant, office, or secret Santa party. Order now and get ready to lock and load some for some drinking fun! Shot glasses are made of red plastic and gold-colored metal. Set includes 4 shot glasses. Each shot glass is 1.5" in diameter and stands 3" tall. Handwash only.